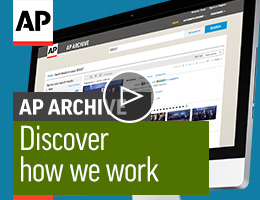 AP Archive is the world’s leading video archive with over 1.7 million video stories dating back to 1895.
from AP's own coverage and from our premium content partners. as dedicated research help and advice from our team of experts. Below you’ll find details of how to use our archive. For a quick outline, check out this short video which summarises everything you need to know. If you need help with your research or just some advice and guidance on using our website, please contact us. What is the purpose of your search? AP Archive is a business-to-business platform reserved for professional use only. If you are interested in AP Archive’s footage collection for viewing or personal use, please visit our YouTube channels where you can view, link to, or embed our videos. Register for an account via our Registration page. Once you register, an AP Sales representative will be in contact to discuss your research requirements, answer any questions you may have about our archive, and go through our licensing rates. In the meantime, you can begin your search. Our simple video search allows you to find the video footage you need quickly and easily. If you are searching for a specific story, the Advanced Search feature will help you narrow down your results. You are able to view the associated thumbnail timeline, shotlist and metadata for all our videos. If you are searching for video footage on a person, event, or location, then take a look at our ready-made compilations - we may have already created a compilation on that subject. Once you find your video you can request a screener (via download or DVD) which allows you to review the video in full - all screeners include a Burnt-In Timecode (BITC). Click the Request Footage icon (located beneath each video). Select Screener and your Delivery Method – please note, Online Download will allow you to view the screener immediately (if the video has been digitised) by clicking in your ORDER HISTORY and selecting Download Now. Most of our content has now been digitised. If your selected video is not digitised, your Sales representative will advise on any costs and when your screener copy will be available for review. Downloading of screeners from digitised content is free of charge. You can review the screener copy and even edit it as a placeholder for the master footage, however, use of the screener in your final project is strictly prohibited (unless a license is obtained). Please contact us if you need any help finding video footage. Once you have started previewing our footage, click MY WORKSPACE in the top navigation to manage your project. For further information on this, please see Using My Workspace within our Help section. Any use of AP or AP partner footage requires a licence. Before you order the master footage, please speak to your Sales representative to obtain a quote. Platform: How will the video be shown (TV, DVD, internet, etc)? Territory: Where will the video be shown (one European country, North America, worldwide, etc)? License period: How long do you want to license the video footage for? Your Sales representative will give you a quote on the cost of your licence based on your answers to the above questions. The quote will be for a minimum duration commitment dependent on usage. Once the license fees have been confirmed, select ORDER HISTORY in the top navigation, click New Licence and complete the form. You will then receive a License Agreement via email which you need to print, sign and scan back to your Sales representative. You can then request the master footage. If you are a new customer, we require minimum payment for your project before you can request the master footage. Return customers need only provide full payment within thirty days of invoice receipt. Please note, only AP or AP partner owned footage is licensable directly through AP Archive. Our collection does include 3rd party footage which is not licensable through us, however, your Sales representative can assist you in seeking rights from the copyright holder. AP has specific pricing and licensing policies for use of AP footage within TV news bulletins and news programming - click here for details. Once you have signed and returned your License Agreement (and made a minimum payment (for new customers)) you can download your high-resolution master footage from the website. Click Request Footage, select Master as the format, and then your preferred delivery method. Once you have submitted your request, go to ORDER HISTORY where you will be able to download your master copy. When you have completed the final edit of your master copy, go to ORDER HISTORY, click the Licenses tab and then Declare on your license. Declare how many minutes/seconds you have used. We will charge you for your final total in increments of 15 seconds. Our Archive team offers a bespoke, personal service tailored to our customers’ research requirements – costing depends upon research time, and the rights requested and intended use of the footage. Our Researchers have an in-depth knowledge of our collection, acute research skills and great instinct, so if you need help with your search, please contact us. You can begin your search by registering here.